Now, how in the world can the company be comfortable making that claim? And how would you, as a client, feel about taking advantage of it? A competent computer technician will tell you at the outset whether he can fix your computer. I mean, come on! How many things can go wrong? Obviously, these are very short lists. You may encounter other errors from the software and hardware that you are running, but there are very few instances where something absolutely cannot be fixed. 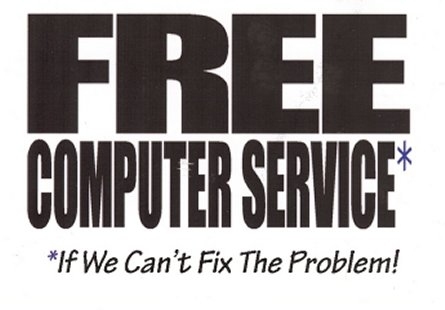 To make the claim this company did is disingenuous; it implies that there will be situations where a customer will receive free computer support. I am pleased that I was able to provide computer support to a larger client base during 2010. Because Heliotropic Systems specializes in home computer users and small businesses (5 to 10 PCs), it was difficult to gain traction against the overwhelming forces of the economy – but I did. And so, I would like to take a moment to say, “Thank you!” to my client base, for helping me achieve growth during a difficult time. Now that the overall economy appears to be settling down, I look forward to 2011 as a year in which I can make a greater improvement in my support of all things computer-related. It is quite obvious that Harry knows some of my clients and what I say to them. And it is true – you don’t need to know about computers. All you have to do is let me do my job so that you can do yours. In the coming year, I hope more of you will contact Heliotropic Systems when you need a professional to take care of your computer systems.